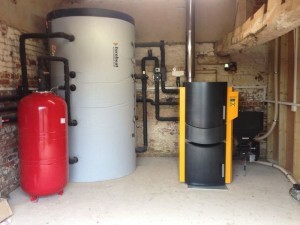 A Renovated Farm house in Upton Upon Severne installs an SHT TDA Log/Pellet boiler! We have recently installed an SHT TDA Log/Pellet combined boiler to heat a renovated farm house. The price of fossil fuels has jumped in unpredictable leaps in recent years, with this trend set to continue for the foreseeable future. With this in mind the owner of this renovated farm house in Upton-upon-Severn chose to install an SHT TDA 40 biomass boiler that not only reduced the cost and reliance on fossil fuels, but also greatly improved their green credentials. The SHT TDA 40 is an ideal choice for this domestic property, offering the convenience of being able to switch between wood log and wood pellet. http://www.euroheat.co.uk/AllArticles/584/CASE/SHT-TDA-UptonuponSevern.html and read the Euroheat case study in full!